Naturally only a fraction of the world's populace knew about the magical name - Dudu Osun, but gradually now the word with its power is being greatly prioritized. Dudu Osun black soap is entirely formulated from natural ingredients and herbs. Then it is also enriched with Shea butter, which is known to be a great solution for dark spots, eczema and stretch marks. The process of making the soap involves the burning of the Osun (camwood) and cocoa pods and other ingredients are added in different proportions. These herbs and plants bring a wonderful soothing effect. • It contains anti-aging properties. With the soap, you will look young always by reducing the appearance of facial lines thereby making it maintain a youthful look. • The soap helps remove dead skin layer.It helps in preventing skin discoloration, getting rid of makeup traces and dark spots. • It reduces oil quantities on the skin. It continually reduces oil quantities in the skin, avoiding blocking of skin pores, therefore, avoiding acne. • It reduces Irritations in Individuals with psoriasis, eczema or other skin conditions. • It is originated from the Yoruba people in Nigeria. “Ose” or ''Osun'' means “soap” in the Yoruba language, while “Dudu” is “black”. It translates to “the black soap”. • As its name suggests the soap is indeed black. It does not easily crumble. 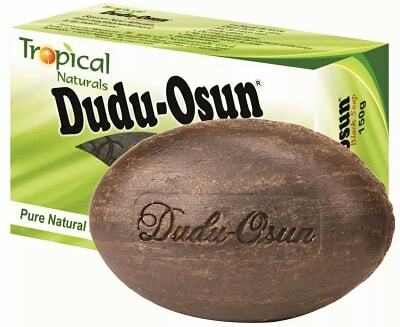 • Unlike many beauty soaps, Dudu Osun black soap does not stain towels. • The soap has a slight fragrance. Its smell is similar to lime juice. • Although it comes in many sizes the common size is relatively large and weighs 150grams and lasts about two times longer than regular bath soaps. • It forms lather easily in warm and cold water. The soap is used the same way as ordinary bathing soap.